Mmm….food. Who doesn’t love food? Even better than run of the mill food, who doesn’t love extremely local, extremely fresh Indiana food? Last month friends and I had the opportunity to sample many of Central Indiana’s deliciacies at the delightful Edibile Indy launch party. 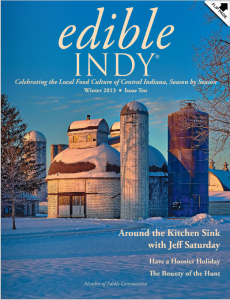 Edible Indy is a local publication that focuses, as you might guess, on the local food scene. It was recently acquired by Jennifer and Jeff Rubenstein, and the new managing editor is Heather Tallman, better known on the Internet at BasilMomma. Edible Indy gathers the best of what Indiana has to offer, and wraps it up year round in four photo-rich issues that will make your mouth water. The launch party we attended was an Edible Indy issue come to life- all of our favorite artisans were there, doling out samples and talking food. 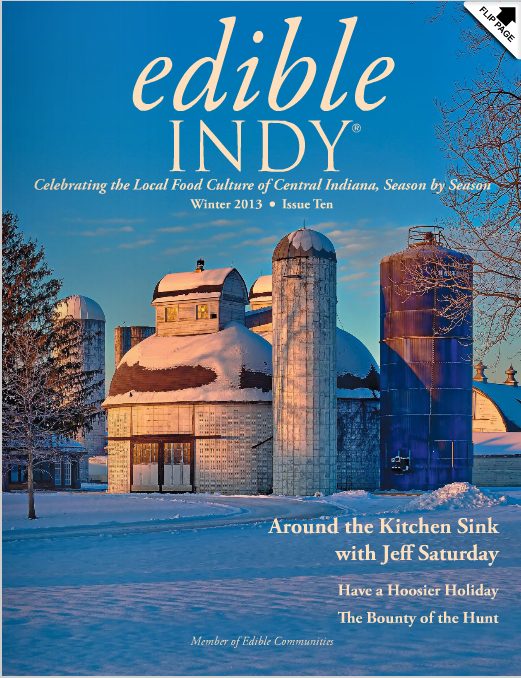 1) The Gift Of Reading (and salivating) : Obviously, a subscription to Edible Indy, would be the perfect gift for anyone who likes food and lives here. Wonder what the magazine looks like? See the latest issue. The Spirits- Because let’s face it, Christmas is cheerier with booze! While the gift of booze isn’t always appropriate, a mixer and the correct glass go a long way in suggesting what you mean. 2) A Drink for the Whole Family Trader’s Point Creamery is serving up delicious egg nog, and even sells them in adorable single-serving glass jars. You could gift that to anyone, and if you know them well, add the bourbon or the rum. 3) A Drink for Momma I had my first bloody mary at the party- Hoosier Momma fixed me up right. This award winning mix is made right here, and the veggie part is soooo good for you! Any bloody mary fan would love a bottle of this mix under their tree. 3a) A Drink for Anyone I also sampled a champagne cocktail I’m still dreaming about. I was not familiar with bitters or St. Germaine before the party, but now they are on my cocktail shopping list. Wilks & WIlson operates out of the Stutz building downtown (does it get anymore Indy than that?) and creates mixers to create your favorite cocktails. There are fun stories to go with each of their creations, which may appeal to the librarians and English majors on your gift list. A collection of mixers, along with bar tools or glasses would make a great gift (hint, hint). The Food- because everyone eats. They may as well eat good, local food. 4) Chocolate for People You Really Like Did you know that Indianapolis is home to a world-famous chocolatier? It’s true. Chocolate for the Spirit is award-winning chocolate, based right here in Indianapolis. Who wouldn’t want chocolate for Christmas? 5) Bacon Goose the Market was also on hand, with a spread of meats and cheeses that makes my usual turkey on wheat look pathetic. Find something particular for the food in your life, or sign your loved one up for the Bacon-of-the-Month Club- talk about a gift that keeps on giving! 6) The Gift of Hearty Sanity Also on hand was U Relish Farms, serving up some amazing lentils. These crock pot mixes make dinner easy on hectic nights- who wouldn’t love the gift of sanity? A couple of mixes paired with a fun ladle or kitchen linens would make a great gift! 7-10) The Gift of Fruit, The Gift of Veggies and The Gift of Shopping at Home As I was stuffing my face overwhelmed with all of this Indiana goodness, I also came across the Green BEAN Delivery table. We’ve been getting Green Bean Delivery for over a month, and I’m still gushing about it. Every week, fresh produce comes to my door- it’s pretty great. As I started to develop this gift guide, I realized the Green Bean Delivery itself would be a great gift- whether you gift someone who is already a subscriber with a gift card, or you sign a loved one up for delivery (or a gift card to try delivery). It would be great for the winter months for people who don’t like to drive in the snow, and it would be great year round for people wanting to eat better. Your weekly Green Bean bin is also a great place to do a little local shopping as well- you can order U-Relish mixes, Best Boy sauces, Endangered Species Chocolate and so much more right on the website! Get it delivered to your house, and your personal touches and your gift is ready without ever having to face the mall. Talk about a win-win. To purchase a gift certificate, current members should visit www.greenbeandelivery.com. Non-members can email or call customer service atinfo@greenbeanindiana.com or (317) 377-0470. A delivery of fresh produce could be exactly what changes someone’s 2014! I am forty years old and I still get excited by the idea of new Disney movie. It’s true. I clapped my hands when I saw the invitation to attend a screening Monday night for the new movie Frozen, and marked it on my calendar immediately. I also didn’t tell the kids we were going until we sat down to dinner that night. A new movie on a Monday night? What’s more fun than that?? Frozen tells the tale of two sisters who used to be close but grew apart. There’s a touch of magic, a lot of laughs, and some not-so-nice bad guys. When Queen Elsa and her sister, Princess Anna, have an emotional argument, it sets off a chain of events that leaves the world, you guessed it, frozen. Anna journeys to find her sister, and meets a nice boy and his reindeer along the way. In their adventures, they meet Olaf, the talking snowman and official side kick of this movie (think Sebastian, Zazu, etc). The kids LOVED Olaf, and days later, they are quoting him. This story line, much like Brave, varies from the traditional “lady in distress meets a prince” plot, and instead focuses on the relationship between the two sisters. Anna’s unconditional love to Elsa shines through, and it’s a good message for anyone about loyalty. All four of us enjoyed this movie- the music is great, the scenery breath-taking, and there are enough plot twists to keep the grown ups guessing. There are a few scenes with a snow monster that are a little intense, but the scenes don’t last long. Do you think you’ll head out to see Frozen this winter? Disclosure: My family was invited to the screening for the purpose of this review. All opinions are my own. We’ve wrapped up preschool and second (!!) grade successfully, and now we are onto bigger and better things- namely, summer vacation. We have day camp happening, we have friends visiting, I have a fortieth birthday celebration weekend (or three) in the works, and we are heading to the Smoky Mountains for vacation. However, there are still many, many, many summer days to be filled. This is where KidVentures comes in. KidVentures is authored by local mama Jen Murray. You may know her as Quatro Mama, as she’s the mom to quad six year old boys (aside- you may have seen her whole family in a recent Conner Prairie television commercial . Jen is a hands-on mama in the best kind of way, and shares some of her families favorite activities in KidVentures. As I flip through the ebook, I see our summer gently unfolding. There’s coffee can ice cream and there’s jump in a pile of leaves, two things I just need reminding to do. But there’s also build your own zipline for toys and build your own sprinkler– can you even imagine?!? KidVentures spells out, step by step, material by material, exactly what’s needed for 50 different hands on, power-free activities for kids. There are also accompanying printables, which includes diagrams for more complex projects. There are also a few forms for activities of observation, and a sweet checklist for a camping trip. When left to their own devices, my kids invent games. Very weird, hilarious games. Maybe this will make it into KidVentures II. I think I’m going to have Meg peruse the list and pick a few to try, and have Andrew do the same thing. On days they aren’t at camp, we can pick a few to do, and we won’t be vegetating in front of Mario Kart or Candy Crush or whatever the next obsession will be. KidVentures is available as an pdf ebook, as well as for Kindle through Amazon. Go check it out, and get your whole family off the couch! 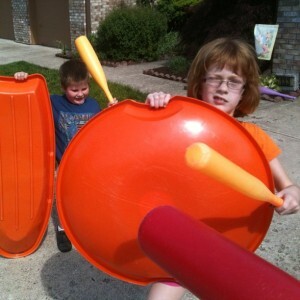 How do you keep your kids engaged in the summer? Do you have rules about electronics and passive activities?